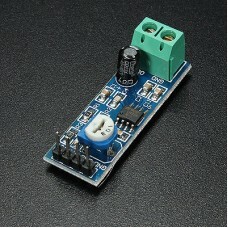 Based on the popular LM386-1 audio amplifier, this tiny PCB module can provide up to 300mW of audio power. Easily configured for either 20 (26dB) or 200 (46dB) gain. Q: How do I reduce the amplifier gain? A: Pins 1 & 8 of the LM386 amplifier chip are used to set the amplifier gain. If they are left open (unconnected), the gain is set by an internal resistor to 20 (26 dB). If a 10 uF capacitor is connected between pins 1 & 8 the internal resistor is bypassed, and gain is set to 200 (46 dB). An external resistor can be used to set the gain anywhere in between. This module has a capacitor and a zero Ohm resistor in series between pins 1 & 8, so the gain is set to 200. If you need lower gain (in other words, a less sensitive amplifier) you can un-solder the zero Ohm chip resistor R1, or simply clip it in half with a small pair of diagonal or flush cutters. Just be careful not to damage the other components on the board.